A local crowdfunding campaign to equip Winchester High Street with a life-saving defibrillator, has drawn the support of Marks and Spencer Winchester. The local store has donated a public access defibrillator (PAD) unveiled by Store Manager, Chris Berry. The PAD, installed on Middle Brook Street, will give the local community 24 hour access to life-saving equipment. If used within three minutes of cardiac arrest the device can improve a person’s chance of survival by as much as 70%. 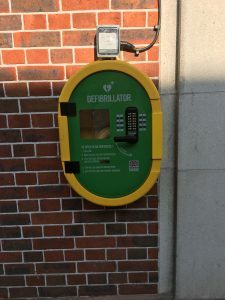 The crowdfunding campaign, launched by Action Hampshire earlier this year, highlighted the PADs in the city and the potential risk to local life due to poor access to such devices in the event of an emergency. This PAD is the only machine in the pedestrianised area of the High Street that is available to the community 24 hours a day. The M&S PAD means Winchester has received two defibrillators in as many months. Action Hampshire reached their fundraising total recently and purchased a machine, which is located further up the High Street, off Staple Gardens, so the Winchester community has easy and quick access to the life-saving equipment when they are in the city centre.